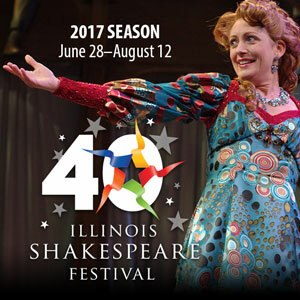 Join us as we celebrate the 40th Anniversary of the Illinois Shakespeare Festival. What better way to celebrate ISF’s 40th season than with a magical, musical, and imaginative interpretation of this Shakespeare favorite. Our family friendly production of this universal comedy follows four young lovers into an enchanted forest for an unforgettable journey of trickery, laughter, and love. Featured in this production is a musical Puck, whose original score is sure to cast a spell on you! Dates: Preview June 28, Opens June 30, Runs July 6, 8, 12, 14, 16, 20, 22, 23, 26, 28, 30, August 3, 5, 6, 9 and 11. If you need special accommodations, please contact the event organizer.